Floristic centers to date, we can say, spoiled customers with a wide variety of diverse, previously unknown colors. 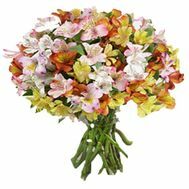 One of these is already popular now - alstroemeria. Its other name is the "lily of the Incas". Bouquets of alstroemerias strike with their variety. The flowers themselves can have different colors from soft white and cream to bright red and purple. 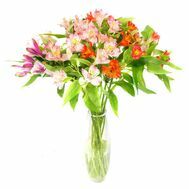 Especially popular are the multicolor alstroemerias, which look particularly elegant and festive. These flowers do not have a pronounced floral odor, so they can be given, including, to people suffering from allergies. 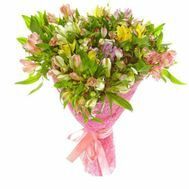 Bouquets of alstroemeria for a very long time retain their freshness and original appearance, so they are so often used for special and solemn occasions, for example, such as an anniversary, a wedding. 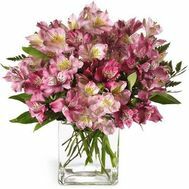 At home, cut alstroemerias can stand in a vase for up to two weeks, this quality is unlikely to be able to boast of any other decorative flower. 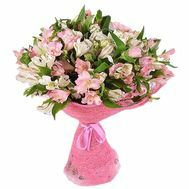 In the "language of flowers" alstroemeria is associated with the epithets "cute", "good", "good". 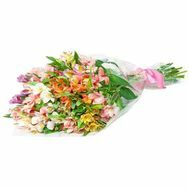 With this bouquet you can make a compliment; he will emphasize the weakness and strength of female nature, combined together. 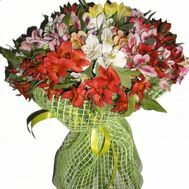 In our online store you can buy an excellent bouquet of alstroemerias for every taste. Competent florists for you can make compositions from small buds of roses and alstromeries, chrysanthemums and other flowers. 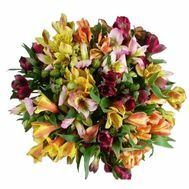 Despite the fact that alstroemerias are often used in combination with other plants and decorative elements, they look no less attractive in bouquets, and a large bouquet of alstroemerias looks especially solemn. Such a gift will certainly attract a lot of attention to itself, and the recipient will be remembered for a long time. 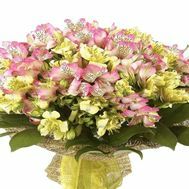 Taking care of our customers, we provide a service "delivery of bouquets from alstroemerias". 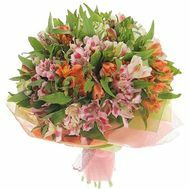 Now please your relatives and relatives with an original bouquet of these flowers you can even from a distance. 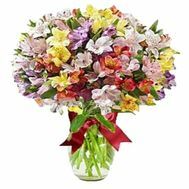 Flowers delivery by our floristic Internet shop is carried out in all regions of Ukraine in a short time. This is a great opportunity to make a surprise, congratulate you on the holiday or just gently remind yourself where you would be now. Bouquets of flowers are special signs of attention. And when they are performed in the best traditions of floristic art, it is doubly pleasant and unexpected. 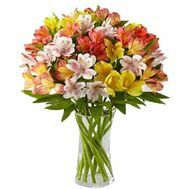 Fast delivery of bouquets from alstroemerias throughout Ukraine will help you to present your beloved with original gifts on absolutely any occasion or even without it.